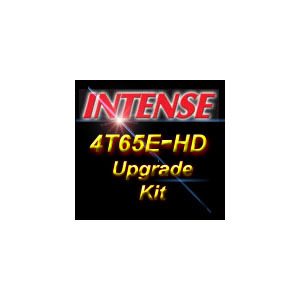 The 4T65E-HD Transaxle Upgrade Kit is a complete package that includes every improved performance component that we build into our transaxles. This kit will allow you to take your stock rebuild and INTENSEify it into a strong, performance oriented rebuild suited for street or strip duty. This package includes all of the CUSTOM ITEMS that we�ve developed to increase the strength and performance in known weak areas of the transaxle. Generally speaking, steeper gear ratios will improve your acceleration and E.T., while reducing your fuel economy and trap speeds. In round numbers, each gear step (from 2.93:1 to 3.29:1 for example) will reduce your quarter mile E.T. by about a tenth of a second and your trap speed by about 1.0 MPH. Your engine speed (RPM) will increase by about 13% at any given vehicle speed and your gas mileage will be reduced by about 5%. Changing from 2.93:1 to 3.69:1 gears will approximately double all the effects listed in this paragraph. Note: If you change the gear ratio in your transmission from stock, you will need to change the shift points and speedometer calibration for your car. This is best done by reprogramming your PCM computer, but can also be done using a VSS Reluctor wheel. INTENSE is no longer manufacturing the reluctor wheels, though we have a couple of NOS parts. The PCM route is much more elegant, and has been available since Spring 2010. Reprogramming for new gearing is a $20 option when getting a new tune, or as an adjustment to an existing INTENSE tune. Please call or email if you have questions.